Mem is the second Mother letter. It symbolizes the Waters, the passive resistance of the biosphere, enabling all impulses and forms to come into being. The oppositions of Aleph in various forms and the Waters will recur repeatedly: Shamaim, (Heavens) Meadim (Mars) Teomaim (Gemini), Mozenaim ( Libra). All these words describe structures in which the forces of life-death (Aleph) and existence (Yod) are related in different ways. The Hanged Man (Mem/40) passively accepts the light, and can be transfigured in Mem, final, 600, cosmic fruitfulness. In the primary triads, it is Water, Mother, Salt and Tamas. The elemental symbolism of all three Mothers letters is transparent. Why is the Hanged Man upside down? It seems a little much to believe the creators of the Tarot would create iconic themes and not use them. In the case of the Tower and its projection into existence, the Hanged Man, we have the only two Tarot trumps with upside-down figures. The progression is obvious: the figures of the Tower fall into the Hanged Man, justs as the Fool steps into the World (or any of our other examples of symbolic transformations). The iconic and thematic symbolism of the column of 4-40-400 is transparent: resistance: archetypal/active, existential/passive and cosmic/exalted. Waite gives the Hanged Man a Tau cross, and unconsciously or not, combines the red and blue dress of the Tower's falling figures. Early representations used a scaffold with two side supports parallel to the black and white pillars of the High Priestess when she is found in her true place. While most of the Tarot are tranparently based on astrological symbolism (Lion/Leo, Scales/Libra, Sun/Sun etc.) The three Mother letters all rely on their formative meanings for their representations. Aleph/Highest Thought for the Fool, the Breath of God (Rouhh Elohim) and Sheen for Angel and three risen figures of Judgement. The question of why the Hanged Man for Mem takes us directly into the integrated formative iconography of the Tarot, which often cannot be seen until the Tarot are restored to their correct positions and natural order. 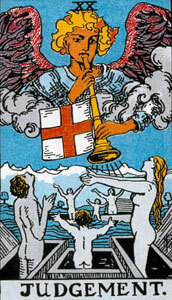 In this case, the Hanged Man must be seen in the context of the Tower and the High Priestess, neither of which are in their correct places in traditional Tarot. Once restored, we can see the clear development of the themes of upright supports and falling figures. Dallet, archetypal active resistance, symbolized by the Tower, di-vides. Existential Mem, perfectly symbolized by the Hanged Man, where the fall of the Tower has been suspended, the figures combined in the perfect symbol of passive resistance. These two are then combined in the final letter of the Hebrew alphabet, Tav, cosmic resistance, the end and the beginning and the door to cosmic life.